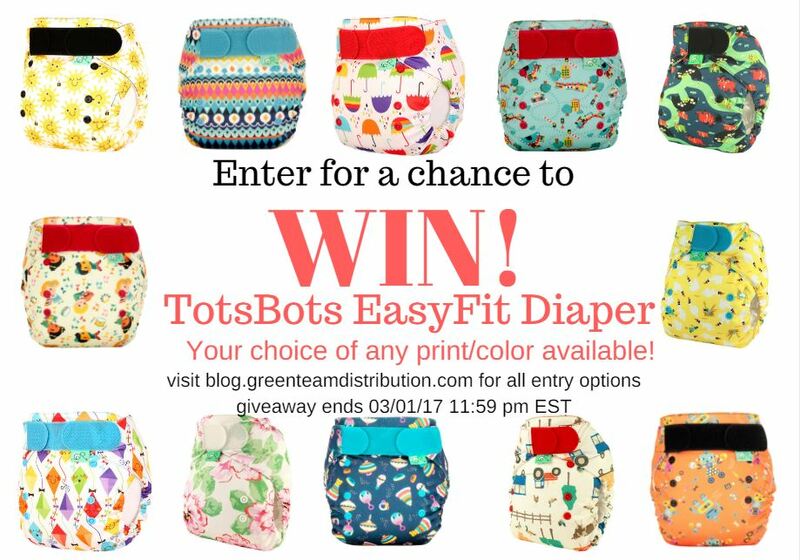 This entry was posted in Blog and tagged cloth diapers, green team giveaways, totsbots easy fit. Bookmark the permalink. We cloth diaper because we have twins. We used to go through so many disposables. It felt gross and cost a lot of money. I was able to get my hands on 9 used totsbots for a very cheap price. I can’t wait to use them, the reviews on these diapers are really good! We chose to cloth diaper to save money and cut down on harsh chemicals and to better to our environment. But now, I also just love the cute factor. Mainly, we appreciate the money savings, but cloth is also more convenient because we never run out of diapers and have to run to the store! To save money! I can’t justify the expense of disposable diapers when I have the time and ability to do cloth! We use cloth because it looks cute on my babies. I love the fun prints! I choose to start cloth diapering because of the cost and because I’m a SAHM I have the time to do the extra laundry. How cute the diapers are is a bonus. We cloth diaper because it is far more economical in the long run, and so much better for the environment! We save clothes by avoiding blowouts, and save our sweet baby’s sensitive skin from chemicals. we started cloth because of allergies, which lead to knowing more about the yucky chemicals throw away diapers have in them. I cloth diaper for money savings, environmental impact, and to avoid chemicals! We chose to use cloth to help save money! I am a stay at home mom and every little bit helps! The main reason I cloth diaper my son is it helps saves us money and they are so much better for him than disposables! The main reason I cloth diaper is because it is economical and better for the environment. We started cloth diapering to save money, but we also like the fact that we’re not creating as much waste. With my husband being in the military our budget for the baby is tight so even before deciding to try for a baby we knew the choice to cloth diaper was obvious, save money for other baby necessities and also do our part to run a greener household and to be able to set that example for our child. Our first is due in July so we are so excited to start our cloth diaper journey. I cloth diaper because I was tired of always running out of diapers and having to come up with the money to buy more that was better spent elsewhere. We use cloth diapers to save on costs and for the environmental benefit. We have twins, so its economical! Besides, I enjoy living more sustainably and I am loving the challenge of doing this when everyone else thinks its so difficult and gross! I wanted to cloth diaper to save money and stay away from chemicals. We cloth diaper for the environment mainly, but we don’t mind the money we’ve saved, either! I couldn’t imagine going back to disposable diapers now, because, honestly, they stink. No children yet. but want to build a stash now to save money and reduce waste. I cloth diaper to reduce the amount of diaper garbage. Main reason we cloth diaper our babies is because my husband agreed to it, without his support of actually changing those diapers we would have never stated with our first. The main reason we cloth is because it is healthier for baby (no chemicals). The main reason I choose to cloth diaper is because my children have sensitive skin and disposables are filled with harsh chemicals. The main reason is to save money. Disposables are ridiculously expensive, and the thought of spending that much money every month for several kids is just crazy to me. instead I can invest a couple hundred in cloth, and reuse for every child, saving us a fortune in the long run. I chose cloth diapers because they are adorable and it saves money in the long run. But mostly because they are cute. I chose cloth diapers because of the environment. Money and the environment. And they don’t smell like disposables!